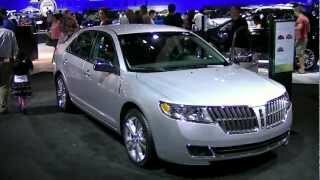 The Lincoln MKZ Hybrid, Lincoln’s first-ever hybrid vehicle, continues to deliver powerful results for the brand in overall green credentials and sales success for 2012. Available for the same price as the gasoline version, Lincoln MKZ Hybrid is the most fuel-efficient luxury sedan in America, delivering an EPA-certified 41 mpg rating in city driving and 36 mpg on the highway. The Lincoln MKZ Hybrid’s fuel economy tops its nearest competitor – the 2011 Lexus HS 250h – by 6 mpg. It also trumps the Lexus with higher net horsepower, more passenger space, enhanced interior, and more standard luxury and segment-exclusive safety features. Not to be outdone, the 2012 Lincoln MKZ gasoline model has the award-winning 3.5-liter Duratec® V6, delivering 263 horsepower at 6,250 rpm and 249 lb.-ft. of torque at 4,500 rpm on regular gasoline. The front-wheel-drive model gets an estimated 18 mpg city and 27 mpg highway; the optional all-wheel-drive model gets an estimated 17 mpg city and 24 mpg highway. Both the Lincoln MKZ Hybrid and front-wheel-drive gasoline model start at $34,645 (MSRP); the all-wheel-drive gasoline model starts at $36,535. And whether owners choose the new Lincoln MKZ Hybrid or the new non-hybrid MKZ, there is a good chance they won’t be let down. The J.D. 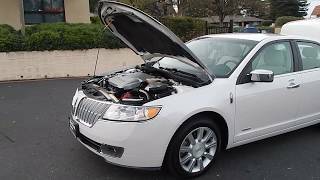 Power and Associates 2011 Vehicle Dependability Study named Lincoln as the top brand based on the number of problems per 100 vehicles. J.D. Power polled 43,700 original owners on problems experienced during the past 12 months on 2008-model-year vehicles after three years of ownership. Out of 35 brands, Lincoln had the lowest number of problems. The 2012 Lincoln MKZ Hybrid uses the 2.5-liter Atkinson-Cycle I-4 hybrid engine, named one of Ward’s2010 10 Best Engines. 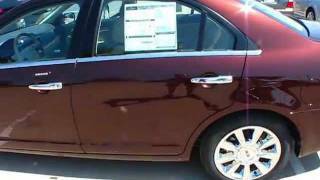 Lincoln MKZ Hybrid can travel more than 700 city miles on one tank of gas. Industry-leading fuel economy comes without sacrificing power. The combined gasoline engine and electric motor provide best-in-class 191 net horsepower. Plus, the pure electric mode on the Lincoln MKZ Hybrid extends to a best-in-class 47 mph – compared with the Lexus battery-only mode, which reaches just 25 mph. Lincoln’s commitment to being environmentally conscious doesn’t stop under the hood and is apparent in both the MKZ Hybrid and non-hybrid MKZ. Lincoln uses a number of recycled materials in its vehicles with an overall goal of using materials that are both renewable and recyclable. 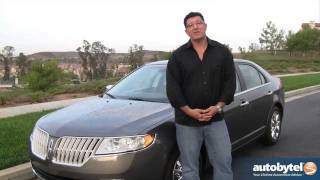 The 2012 Lincoln MKZ Hybrid comes standard with features and technologies that are either not offered on the Lexus HS 250h or are available only at an extra cost. The MKZ Hybrid, for example, has SmartGauge™ with EcoGuide. This highly successful interactive technology provides real-time information to help drivers maximize fuel efficiency, and coaches drivers on how to optimize hybrid performance. Lincoln takes SmartGauge to the next level of engagement by giving drivers enhanced positive feedback on long-term fuel efficiency and driving performance through the growth of virtual small flowers on the system’s right-most screen. Lincoln’s white flowers, inspired by apple blossoms, remain permanently unless long-term fuel economy is reset. Both MKZ models feature Lincoln SYNC, an innovation that provides an omnipresent link to contacts and information. In addition to Bluetooth® phone, audible text and MP3 capabilities, Lincoln customers can access Vehicle Health Report (VHR) and 911 Assist™. Lincoln SYNC Services leverages industry-leading voice recognition software, integrated GPS technology and a customer’s Bluetooth-capable mobile phone. SYNC applications provide simple, hands-free access to personalized traffic reports, precise turn-by-turn driving directions and up-to-date information including business listings, news, sports and weather. Available for the first time on both models of the MKZ is SYNC® AppLink™, a software application that gives Lincoln SYNC users hands-free voice control of select smartphone apps. The 2012 model year marks the first time AppLink has been available for Lincoln. The available voice-activated Navigation System includes HD Radio™ technology, which enables more listening options and digital sound quality. No additional equipment or cost is involved. The Lincoln Premium Sound System features nine speakers and an input jack, and SiriusXM Satellite Radio with a six-month prepaid subscription is standard. The unique-to-Lincoln TXH® II Certified Audio System with 5.1 Surround Sound is available through the Ultimate Package. Lincoln is the only carmaker in the world to offer customers the TXH audio experience with a system that delivers clean, crisp sound with very little distortion as each speaker is strategically placed to ensure a high-impact listening experience. It features a 12-channel amplifier that delivers 600 watts to 14 speakers and two subwoofers. Also, multichannel DVD audio discs can be played at any time. When in park, DVDs may be played. BLIS® (Blind Spot Information System) with cross-traffic alert is available for the Lincoln MKZ as part of the Navigation Package. Using two multiple-beam radar modules, the system can detect when a vehicle enters the defined blind spot zone and illuminates an indicator light on the corresponding sideview mirror. Cross-traffic alert uses the same technology to help detect if a car is approaching from either side within 45 feet of the vehicle when backing out of a parking space. The Navigation Package also features a rear view camera. Available as part of the Ultimate Package are adaptive headlamps that rotate according to speed and steering inputs to allow for greater visibility around turns. Rain-sensing wipers, which are activated when they detect moisture on the windshield, are also part of the package. Safety is at the forefront of Lincoln vehicles, and Lincoln MKZ Hybrid and the standard MKZ both come complete with several safety technologies including Personal Safety System™, a Lincoln-exclusive suite of seven protection technologies that work together to help protect vehicle occupants. The system includes dual-stage front airbags and an occupant classification system to sense whether the passenger seat is occupied. It tailors – or suppresses – airbag deployment to help provide an appropriate level of protection. It also features the Belt-Minder® system to remind front seat occupants to buckle up. Other safety features include child safety locks for the rear seat, Tire Pressure Monitoring System (TPMS) and LATCH (Lower Anchors and Tether anchors for Children). Another standard safety feature is AdvanceTrac® electronic stability control with brake-actuated traction control. The system is designed to help drivers maintain steering control and directional stability in adverse conditions. The MyKey® owner control feature is Lincoln-exclusive and allows owners to limit speed and audio volume to encourage teens to drive more responsibly. MyKey encourages seat belt use, provides earlier low-fuel warnings and can be programmed to sound chimes at 45, 55 and 65 mph. Integrated spotter mirrors and a Reverse Sensing System also are available. The Lincoln MKZ is built at the Hermosillo (Mexico) Stamping and Assembly Plant.